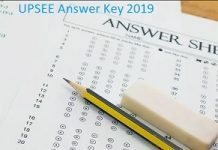 BEEE 2019 Exam Pattern: The BEEE 2019 Exam Pattern will carry all the information about Bharath University Engineering Entrance Examination. All those who are going to take the exam must check the exam pattern along with the syllabus. The subject wise syllabus will be released for Physics, chemistry, and mathematics. Candidates who are appearing for the exam must make sure that they also know the preparation strategies to prepare in a better way. The application form for Bharath University Engineering Entrance Examination 2019 is going to be released soon and students must start preparing for the same as soon as possible. MODE – The exam will be conducted in both online as well as offline mode. It is expected to be held in two-phase- morning and afternoon. DURATION – It will be conducted for 2 hours 30 minutes. NUMBER OF QUESTIONS – The question paper will have 100 questions in total. SECTIONS – There will be 4 sections – Physics, chemistry, mathematics, and English. MARKING SCHEME – 1 mark will be awarded for each correct answer. There is no provision of negative marking. Physics Mechanics, Units and Measurement, Gravitation, Mechanics of Solids and Fluids, Oscillation and Wave motions, Heat and Thermodynamics, Electricity and Magnetism, Ray and Wave Optics, Dual Nature of Matter and Nuclear Physics, Atomic Physics and Relativity, Electronics and Communication. Chemistry States of Matter, Atomic Structure, some basic concepts in Chemistry, Atomic structure, Chemical families-periodic properties, Chemical Bonding and Molecular structure, Electrochemistry, solutions, Chemical Equillibrium, Surface Chemistry, Chemical kinetics and catalysis, Hydrocarbons, Some basic principles of Organic Chemistry, Organic compounds containing Nitrogen, Organic compound s containing Oxygen, Chemistry in everyday life, Polymers. How to prepare for BEEE 2019? Make a timetable on a daily basis to manage your time of each day. Know the correct syllabus to gather the right study material. You must check the official website of Bharath Institute to know the syllabus officially released. After completing the syllabus, you must practice questions on sample papers. You can try the online test and various other offline tests that will help you practice more and work on your weak sections. You must not forget to eat healthily and have a normal sleeping pattern during preparations so that you feel fit on the day of the examination. The Bharath University is a deemed to be university, therefore, candidates must make sure that they know the whole timetable if they want to appear for the examination. if you have any query, do ask us in the comments section below! 3 How to prepare for BEEE 2019?